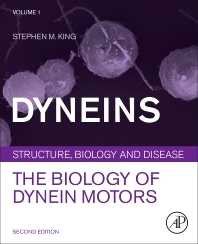 Dyneins: The Biology of Dynein Motors, Second Edition, offers a broad view of dyneins from structure, composition and organization, to biology of dynein function in both cytoplasm and cilia. As the second book in a pair on this topic, these works provide an overview of dyneins, from structure and function, to dysfunction and disease. Since the first edition, enormous strides have been taken in understanding dynein structure, its organization in the axoneme, single molecule motor mechanics and the consequences of defects for human biology, disease and development. This second edition is extensively revised, with coverage expanded from 24 to 42 chapters. Much of the expanded coverage occurs in Volume Two on dynein dysfunction and disease, such as the role of dynein and cancer, while Volume One covers the history and evolution of dyneins, dyneins in ciliary biology and cytoplasmic dynein biology. Stephen M. King is Professor of Molecular Biology and Biophysics at the University of Connecticut School of Medicine and is also director of the electron microscopy facility. He has studied the structure, function and regulation of dyneins for over 30 years using a broad array of methodologies including classical/molecular genetics, protein biochemistry, NMR structural biology and molecular modeling, combined with cell biological approaches, imaging and physiological measurements.